The kingdom is in need of a new Master Builder, and you are among tyhose vying for the coveted post. To be selected, you must impress the monarchy by constructing the most majestic medieval metropolis. Building your city will require the help of a diverse cast of characters. Will you hire the elusive Thief to pick one of your rival's pockets, or will you commission the Architect to quickly build several districts? Only the best city will earn its steward the title of Master Builder! 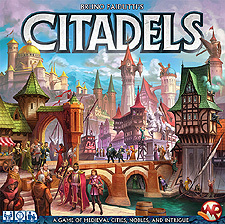 Published in 25 different languages and nominated for numerous awards, Citadels is widely considered to be one of the great card games of the modern era. This definitive edition of the game includes characters and districts from the original game and its expansion, as well as a brand new cast of 9 characters and 12 completely new districts, offering more variety than ever before!